After many years of development AllureGlow® provides products containing a photo-luminescent pigment that is unparallel in the world for its useability, performance and cost effectiveness. 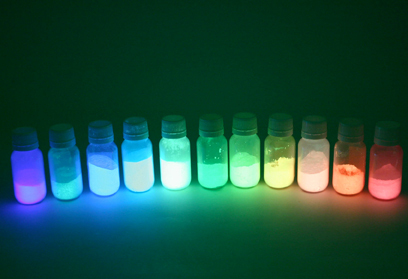 We have developed techniques to enhance photon-emitting crystals (photo-luminescent pigment) with no known toxicity or radioactivity. AllureGlow® utilizes a range of cost efficient and unique premium grade strontium aluminate based photo-luminescent pigments that are now revolutionizing the world of photoluminescence. Advantages of the crystals include brightness - the luminosity is higher than any other form of crystal. This is because the crystal are manufactured to our Patented formulation using only premium grade raw materials and our processing methods are designed to give the utmost purity to the finished product with the minimum grinding of the crystals. The pigment used in our products are believed to be a world first in having the superior performance of a strontium type compound, that can be supplied as water or solvent based and dispersed in paints, inks, ceramic glaze and extruded into most plastics and resins. The water proof pigment does not lose its glow in water or in water-based formulations. There are a wide range of particle sizes available which enable its use in applications where very fine particles are required or where larger particle sizes are suitable. Just let us know what type of application you have and we will recommend the most suitable pigment size. Crystal appearance: In daylight, pigment is pale green in colour. The level of daylight green color of our pigments varies due to particle size and performance grade. Higher glow pigments with larger particle size are more green than lower performance finer pigment. Some glow pigments have a whitish daylight color, such as the Sky Blue, White and Purple glow pigments. 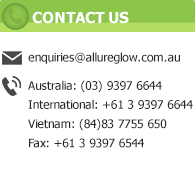 Allureglow® is the registered trade mark of Allureglow® International Pty. Ltd. owned by The Skycore Group Pty. Ltd. The owner of this trademark is aware of several other companies around the world who are utilising the Allureglow® trademark and or name without permission or authorisation of The Skycore Group Pty. Ltd. The Skycore group assumes no connection or liability in relation to products sold or information communicated by companies illegally trading as or utilising the Allureglow® trademark without express written permission from The Skycore Group Pty. Ltd. .
NEW PRODUCT: Special glow in the dark pigment / powder for mixing into epoxy resin. NEW PRODUCT: Glow in the dark rock / aggregate. Super high glow available in aqua blue, Sky blue and Green glow. A range of exciting business opportunities are now available including licensed distributor and licensed manufacturer. To enquire about the opportunities please complete the form by clicking the link below. 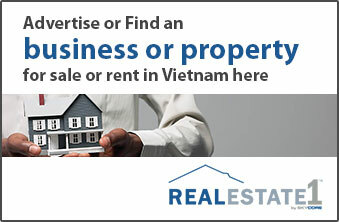 We will contact you soon to discuss the opportunities further.